With the warmer weather, more insects come into our house. After a frenzied dance at the window, this crane fly eventually sat down, allowing me to get this double reflection in the window pane. Crane flies (Leptotarsus sp.) may look like oversized mosquitoes, but they are harmless to people. 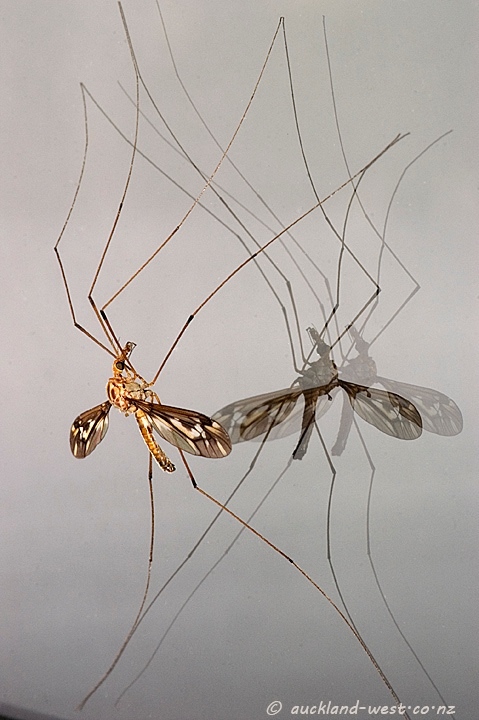 Commonly they are known as ‘daddy longlegs’, although they share this name with a family of spiders. The paddle on a stick that is visible in the reflection next to the wing is one of the two halteres, rudimentary wings which are important for the balance while flying.